Bushman Equipment, Inc. offers a complete line of quality-built jib cranes and jib attachments to meet the most demanding material handling requirements. There are various jib crane models from which to choose: floor-mounted pillar types; top and bottom-supported units; wall or column-mounted versions; and models that afford manual or motorized rotation. 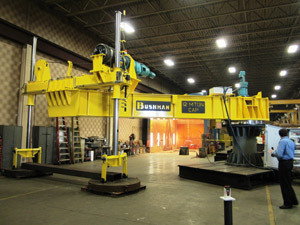 Bushman specializes in custom-engineered jib cranes for unique applications. Built to the highest industry standards, Bushman jib cranes have earned a reputation for ruggedness and durability. This is a top and bottom supported jib crane that telescopes. These jib cranes are particularly useful when ceiling height is limited. They can be mounted to a wall or column within three inches of the ceiling, providing valuable additional inches of lifting range. 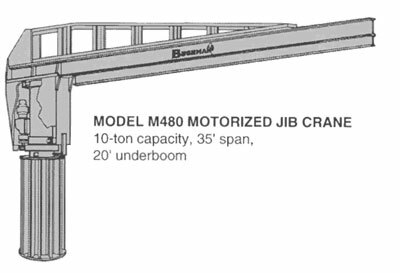 Entirely self-supporting, without tie rods or other bracing, the jib crane can be installed with the girder at maximum available height and with very little clearance necessary. 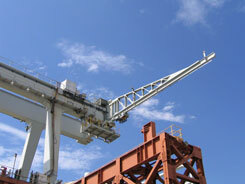 This jib crane, nicknamed “Super Jib”, is a full cantilevered model with a 60-foot span and a capacity of 7 1/2 tons. The jib is mounted onto an existing outdoor gantry crane at a nuclear power plant in California. The Super Jib required seismic calculations, special surface preparation with epoxy paint, and powered rotation. To the satisfaction of our customer, Bushman Equipment, Inc. designed and built this impressive piece in eight weeks. This 12 metric ton, 24 ft reach jib crane lifts a distribution trough in an aluminum mill cast house. 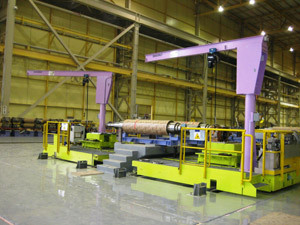 These pictures show the partially assembled jib performing a factory load test. 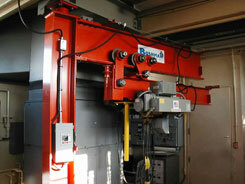 Bushman worked with the world’s leading manufacturer of aluminum chill casting machines on this project. 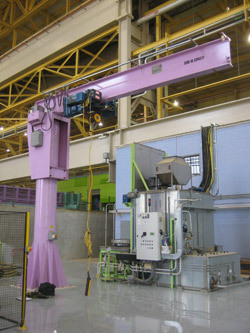 This free standing jib crane was made to support radiation detection equipment for a southern U.S. steel mill. Inbound trucks hauling scrap steel are scanned for radioactive material before being allowed entry to the scrap yard where steel is recycled. Bushman has partnered for years with Cochran Marine, LLC, a leading provider and operator of electric shore power systems for passenger cruise ship ports and cruise lines. 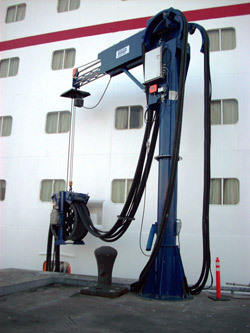 These specially designed “cable positioning devices” lift, payout and retract the heavy cables and plugs used to connect the ship to “clean” shore power while docked in a port-of-call. Heavy duty A-Series floor mounted jib cranes are designed and constructed for industrial use with years of trouble-free service. 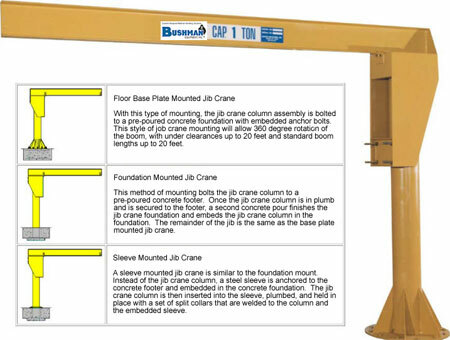 The jib crane boom is fabricated out of a steel I-beam or a wide flange beam and has removable end stops. A machined lower roller carriage is housed in the jib crane head section that features heavy steel side plates. The lower roller carriage is mounted on adjustable tension bolts to allow for field adjustments. The support column for the jib crane is constructed out of steel pipe with a heavy base plate and reinforcing gussets. Bushman® jib cranes can be designed with steel bases to fit your specific foundation or attachment point, such as this mill roll machining station. Motorized rotating jib cranes are widely used to control or position the load in an area that is generally inaccessible to material handling equipment, or where the load, weight or duty cycle make it impractical to employ manual rotation. 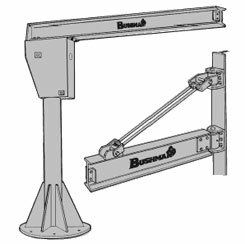 Bushman Equipment, Inc. motorized jib cranes are designed to provide reliable, long-life performance with minimal maintenance. 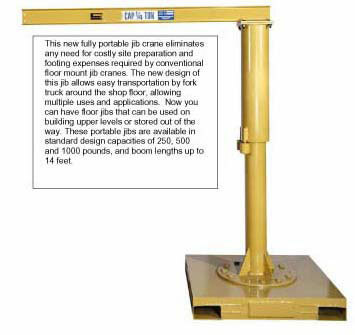 Jib cranes are available either with a base plate for floor mounting or without a base for mounting the pillar directly into a concrete foundation. In addition to the standard jib crane construction features, these motorized units include motor, variable speed electronic drive, heavy-duty chain drive, pintle pin and reducer. Optional equipment includes current collector rings for 360° continuous electrification, and tagline assembly for festooned hoist conductor cables. Control push buttons are usually incorporated into the hoist push button station to facilitate operator control (push button optional). 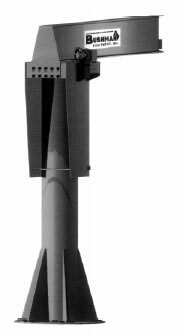 The motorized drive rotation of the jib boom typically provides a rotation speed of 1/2 RPM, but speeds up to 1 RPM are available. 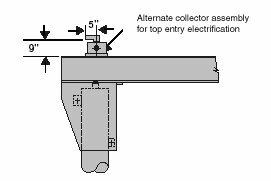 Optional bottom entry electrical collector assembly includes junction box, internal wiring, collector assembly in web of beam, and junction box in head assembly for power connection to electrical hoist. 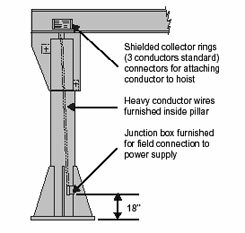 Top entry electrical collector assembly may be used on all size cranes where electrical power source can be connected from top of jib. Internal wiring in pillar is not necessary. Reduce Worker Strain and Prevent Injuries! This new Motorized Jib Crane Drive Kit can be added to any new or existing heavy duty jib crane. The kit can be field installed and provides 360 degree powered boom rotation. (Note: A top entry electrical collector used in conjunction with the RMD100 drive kit is recommended for 360 degree rotation.) The drive kit is available in 230/460 volt, 3 phase, 60 hertz, electrical power with 115 volt control circuit. Bushman can now provide a retrofit package to upgrade manual jib cranes to motorized units, complete with electrical controls and a pendant. The kit comes with everything that needed for installation. The RMD100 Motorized Drive Kit is available for jib cranes with capacities up to five tons and maximum boom length of 20 feet. Wall Mounted jib cranes are constructed from high grade steel components and are designed for trouble free use. The hinges are equipped with self-lubricating Teflon bearings and hardened pins. 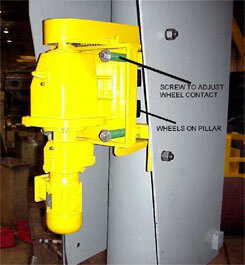 Wall mounted cranes are primed and finished with Safety Yellow enamel. Other colors are available. Please contact the factory for details. Wall mounted jib cranes are available in two styles, each one with standard boom lengths up to 20 feet and capacity up to 6,000 pounds. 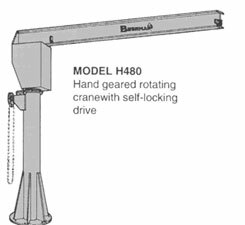 This style of wall mounted jib crane is ideal when maximum head room is needed for your lifting application. The boom has 180° of manual rotation. Please contact the factory for other options and accessories. 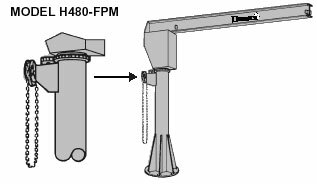 The overbraced tie rod wall mounted jib crane provides economical hook coverage with 180° manual rotation. The tie rod has threaded ends and will allow easy field adjustments. Assembly required at installation. This new fully portable jib crane eliminates any need for costly site preparation and footing expenses required for conventional floor mount jib cranes. The design of this jib allows easy transportation around the shop floor by fork truck. This means it can serve multiple uses and applications. It can be used in upper floors of your facility and then stored out of the way. Portable jibs are available in standard design capacities of 250, 500 and 1,000 pounds. Boom lengths up to 14 feet are available. The only foundation mounting Bushman recommends is the one shown on the approval drawing supplied with the crane. A qualified person must determine the adequacy of any other method of mounting. How critical is leveling and how accurate does plumb have to be with floor mounted jib cranes? 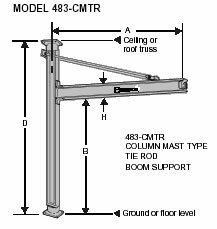 The vertical column of a floor mounted crane should be plumb. These cranes rotate very easily. 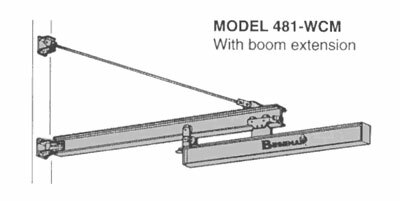 With a load on the boom, if the column is not plumb, the boom may rotate by itself. In order to prevent unwanted boom rotation, it is beneficial to spend extra time ensuring the column of a floor mounted jib crane is plumb. How often is concrete poured accurately enough to merit not using a mortar bed? Alternatively, should it be standard practice to use a mortar bed? 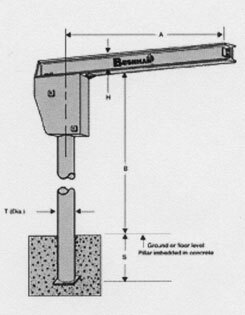 Floor mounted jibs require a concrete foundation with reinforcing steel rods and anchor bolts embedded in the concrete. 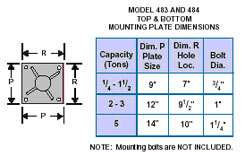 The wall-mounted jibs require high strength mounting bolts. These bolts must be no less than Grade 5 quality. The size is specified on the approval drawing and ranges from ½ to ¾ inch diameter. Usually a minimum of a man-lift and a forklift truck are required to install the cranes. Large cranes may need additional equipment for installation. Where is a wall jib mounted? 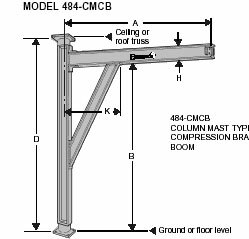 Wall mounted jibs must be mounted to a structure determined to be adequate by a qualified person. The thrust and pull forces given for each jib, the weight of the jib, the capacity, impact, and hoist weight are some of the factors that must be taken into consideration. What are the bolt/nut torque requirements for mounting? 3/8″ Grade 5 bolts/nuts – 20 ft-lbs. 1/2″ Grade 5 bolts/nuts – 50 ft-lbs. 5/8″ Grade 5 bolts/nuts – 100 ft-lbs. 3/4″ Grade 5 bolts/nuts – 175 ft-lbs. 1″ Grade 5 bolts/nuts – 200 ft-lbs. Most jibs are shipped by a common carrier. They are usually shipped loose in a closed trailer with the hardware in a separate box. Some of the larger cranes require a flat-bed truck or trailer. Other methods are available. For an additional fee, units may be palletized to protect the finish. The typical voltage for large motors used in lifting devices is three phase and usually 230 or 460 volts. (230-3-60 or 460-3-60). 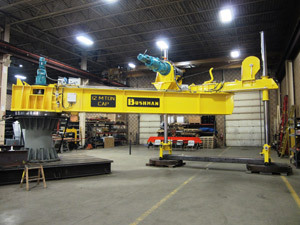 What is the life expectancy of Bushman® jib cranes? A jib’s life expectancy depends on the environment, the severity and frequency of use, the ambient temperature, and other factors. For this reason, we cannot provide a value for life expectancy. Bushman® jib cranes are designed for daily use, and with the exception of routine maintenance, should provide years of trouble free operation. The rated capacity of the jib is the maximum “live load” the jib can pick up. 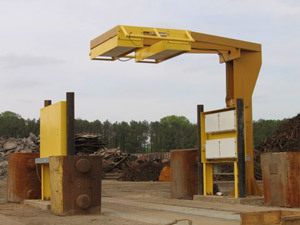 A typical hoist and trolley weight is assumed and added to the rated capacity for design purposes. These assumed weights are 15% of the rated capacity and are not considered part of the “live load”. However, hoist and trolley weights greater than 15% of the rated capacity should be considered part of the “live load”.